If you're here from Kayla Aimee, welcome! I'm so glad you're here! Feel free to poke around. If you're interested in seeing some of my other DIY projects, you might want to start with this page. As I mentioned last week in my July Project Round-Up post, there are some exciting things happening in the world of this little blog, and today I get to share one of them: I'm going to be a contributing writer for the Kayla Aimee blog! In fact, my first post is up over there today! I'll be writing simple tutorials for DIY projects and crafts, and maybe sharing a few tips and tricks on things like photography along the way. It'll all be original content, so if you just can't get enough of MRFB, you can find one extra project over there each month from me. I'll be sure to let you know when the posts go up :). Can you tell I'm excited? In case you're unfamiliar with Kayla Aimee, she writes a lifestyle blog that has a little bit of everything on it, including her experience of being a mom to an adorable preemie, Scarlette. She's a deal finder, former professional scrapbooker and is currently writing a book. She writes beautifully and honestly about all sorts of things in her life - both the fun and the hard parts, which I think is why so many people love reading her blog. She's real, y'all. Not afraid to share the joys or get into the nitty gritty of life. For more of her story, head over to her about me page. Needless to say, I'm thrilled to be a part of her team! 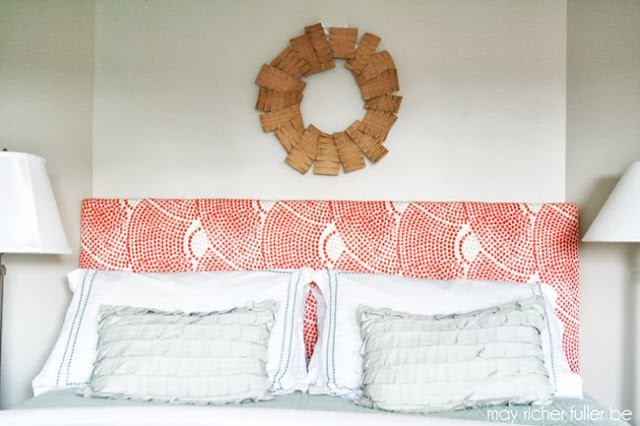 If you're curious about what my project is on her blog this month, it has a little something to do that big, empty space above my pretty new upholstered headboard. When we last visited my bed, you saw that I put my pleated paper wreath up as a placeholder in that big ole empty space above the headboard. I mentioned that it wasn't a permanent fixture, and that I needed something else to put over the bed. Well, I found (well, made) a solution - a DIY "dipped" wood shim sunburst mirror! Heyo! Lookin' good, eh? 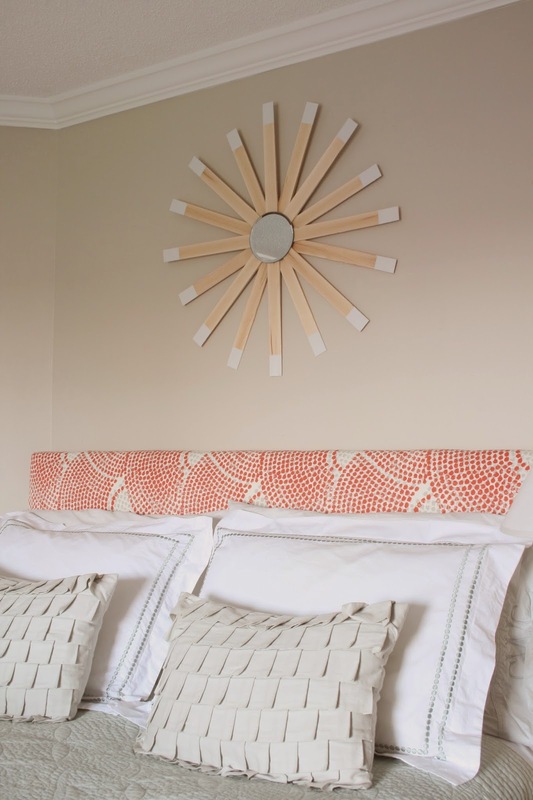 I love the modern touch, and the white paint-dipped edges are a fun twist on the ever-popular sunburst mirror. I think it makes quite a statement up there on the wall! For the full tutorial and details on this project, you'll need to head on over to Kayla Aimee's blog! P.S. 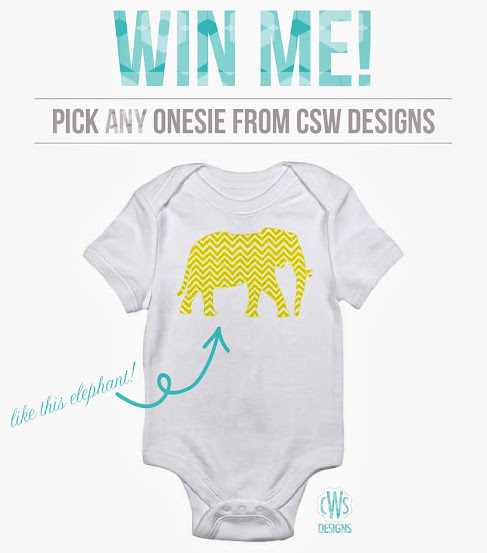 Don't forget to enter the giveaway for a onesie from CSW Designs! You have until 8/15/13 at midnight!